For pie crust: Process 3/4 cups flour, salt, and sugar together in food processor until combined, about 2 one-second pulses. Add butter and shortening and process until homogenous dough just starts to collect in uneven clumps, about 10 to 15 seconds. Scrape down sides and bottom of bowl with rubber spatula and redistribute dough evenly around processor blade. Add remaining 1/2 cup flour and pulse until mixture is evenly distributed around bowl and mass of dough has been broken up, 4 to 6 quick pulses. Sprinkle vodka and water over mixture, briefly pulsing 2 to 3 more times. Flatten dough into 4-inch disk. Wrap in plastic wrap and refrigerate at least 45 minutes or up to 2 days. Adjust oven rack to lowest position, place rimmed baking sheet on oven rack, and heat oven to 425 degrees. Remove dough from refrigerator and roll out on generously floured (up to ¼ cup) work surface to 12-inch circle about 1/8 inch thick. Roll dough loosely around rolling pin and unroll into pie plate, leaving at least 1-inch overhang on each side. Working around circumference, ease dough into plate by gently lifting edge of dough with one hand while pressing into plate bottom with other hand. 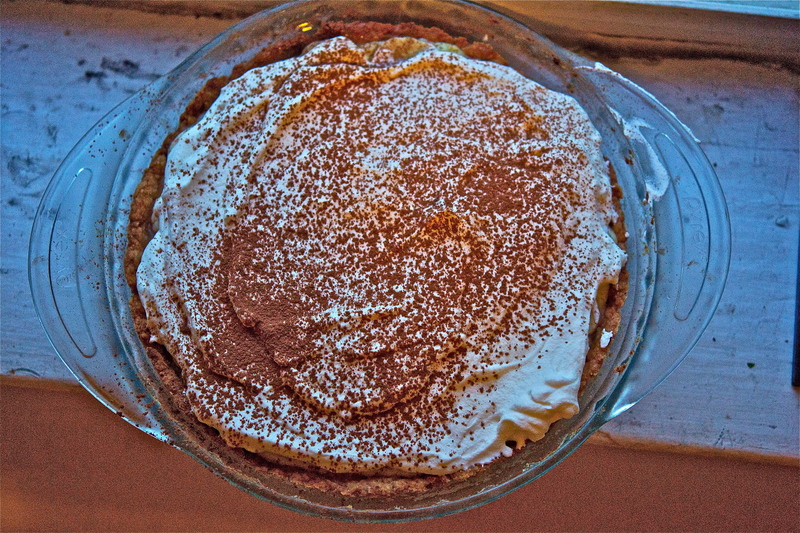 Trim overhang to ½ inch beyond lip of pie plate. Fold overhang under itself; folded edge should be flush with edge of pie plate. Flute dough or press the tines of a fork against dough to flatten it against rim of pie plate. Refrigerate dough-lined plate until firm, for at least 30 minutes. For the Pastry Cream: Have a bowl ready for cooling the pastry cream with a fine-mesh sieve resting on the rim. Pour the milk into a heavy saucepan. Split the vanilla bean in half lengthwise and use the tip of a sharp knife to scrape the seeds from the pod halves into the milk. Add the salt, place over medium-high heat, and bring to just under a boil, stirring occasionally and making sure that the milk solids are not sticking to the bottom of the pan. Meanwhile, in a mixing bowl, whisk together the cornstarch and sugar. Add the eggs and whisk until smooth. When the milk is ready, slowly ladle about one-third of the hot milk into the egg mixture, whisking constantly. Pour the egg-milk mixture back into the hot milk and continue whisking over medium heat until about 2 minutes. I order for the cornstarch to cook ad thicken fully, the mixture must come just to the boiling point. You want to see a few slow bubbles. Remove from heat and immediately pour through the sieve into the bowl. Let cool for 10minutes, stirring occasionally to release the heat and prevent a skim from forming on top. For the Caramel: Pour the cream into a small, heavy saucepan. Split the vanilla bean in half lengthwise and use the tip of a sharp knife to scrape the seeds from the pod halves into the milk. Place over medium-high heart and bring to just under a boil, stirring occasionally. Reduce the heat to low to keep the cream warm (I actually just microwaved the cream for two 25-second intervals once the sugar neared its amber color; saved both stovetop space and the fear of burning the cream). In a medium, heavy saucepan, combine the sugar, water, salt, and corn syrup. Bring to a boil over medium heat, stirring to dissolve the sugar. Then cook, without stirring, until the mixture is amber colored, 5 to 8 minutes. Remove from heat. Carefully and slowly add the cream to the sugar syrup. The mixture will boil vigorously at first. Let the mixture simmer down, and then whisk until smooth. Add the lemon juice. Let cool for about 10 minutes. Cut the butter into 1-inch chunks and add them to the caramel one at a time, whisking constantly after each addition. Then whisk the caramel periodically as it continues to cool (NOTE: can be made the day ahead – bring back to room temperature slowly using a double boiler). Final Assembly: Have the pie shell ready for filling. Melt chocolate in a double boiler. Remove from heat. Using a offset spatula, pastry brush, or the back of the spoon, spread the melted chocolate evenly over the bottom of the pie shell. Refrigerate for 10 minutes to set the chocolate. While the chocolate is setting, pour heavy cream into a mixing bowl and whip with a whisk or a mixer fitted with the whisk attachment until thickened. Add the sugar and continue to whip until it holds medium-firm peaks. Remove the pie shell from the refrigerator and drizzle 1/3 cup of the caramel evenly over the chocolate (refrigerate the remaining for another use -great with pretzels and apples!) 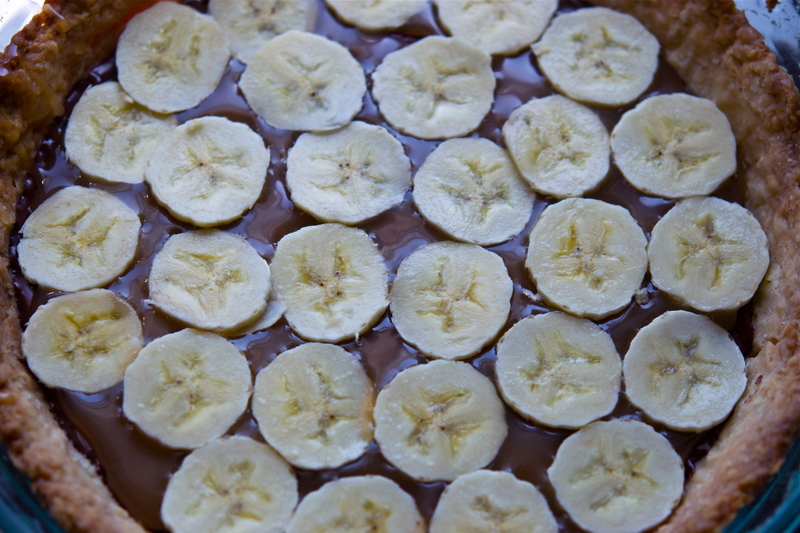 Arrange a layer of thinly sliced bananas over the caramel. Transfer the pastry cream to the shell. Arrange the remaining banana slices evenly on top, lightly pressing them into the cream. To read more about this dish an my musical pairing, click HERE.